In 1972, Daniel Statnekov discovered a Pre-Columbian psycho-acoustical whistle made of clay at an auction in Pennsylvania. 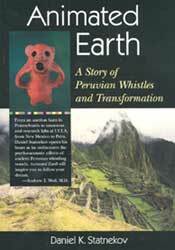 He spent the next 15 years researching the objects which are known as the "Peruvian Whistling Vessels." He wrote about these experiences in his book, Animated Earth, published in 1987 by North Atlantic Books. August, 2003 - the second edition of the book is now available here. "From an auction barn in Pennsylvania to museums and research labs at UCLA, from New Mexico to Peru, Daniel Statnekov traces his heart-opening journey in rediscovering the psycho-acoustic effects of ancient Peruvian whistling vessels. I am glad I was able to share a bit of that journey with him and hope that Animated Earth will inspire you to follow your dream." - Andrew T. Weil, M.D.